HIGH RESOLUTION: Video resolution 1920 x 1080P, easy to operation- just plug the camera into the socket, it will start record automatically. 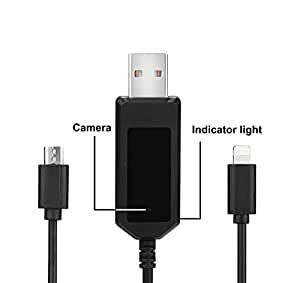 WITHOUT ANY BUTTON: This usb charger cable camera has a mini and HD Colour Video,allows you to see exactly what is going on when you aren’t around in your home, office, business, or wherever you need covert security. MOTION DETECTION: Never worry about it wastes a lot of recording time, You can watch what you recorded and what happen in your phone, please follow the instruction to setting motion detection. REAL PHONE CHARGER: The mini camera looks like a regular phone charger cable, the charger cable be able to charging for your Android phone and other devices,nobody will realized this is a mini camera. LOOP RECORDING: Loop recording automatically overwrites oldest files if the memory fills up. you’ll never miss a thing even if the memory fills up.